Exclusively Ours! An Allan Robin Design!! Lead & Nickel Free!! New! Fully Detailed Soccer Pendant On Black Suede Leatherette Necklace. The Soccer Ball Pendant On This Necklaces Has An Epoxy Dome And Dangles Your Initials! To Order Additional Bracelets For Other Team Members With Different Numbers Or Initials, Please Call Your Order In Toll Free At 1-800-961-2463, Or Add To Cart And Then Click On; "Keep Shopping" And Order The Additional Necklaces. Quantity Pricing WILL Keep Up In The Shopping Cart As You Add More. Remember You Have Several Things To Choose, And Boxes To Check. 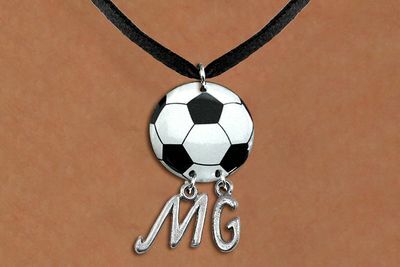 These Soccer Necklaces Are Custom Made To Your Selections. Please Double Check Your Selection. Call Us, Even If It Is Just A Simple Question That You Have. 1 - Have The Number Of Necklaces That You Want.